Ghosn: "I have played a historic role in building this alliance and I have legitimacy in the three companies that allows me today to act in the way that maybe other people would not be able to." TOKYO -- Those bracing for a potentially radical change in one of the world's largest carmaking alliances can rely on one thing: Its driving force will stay put. Carlos Ghosn, who built the three-way union of Renault, Nissan Motor and Mitsubishi Motors, said overseeing the group is a job he can keep adding value to and isn't looking to relinquish. 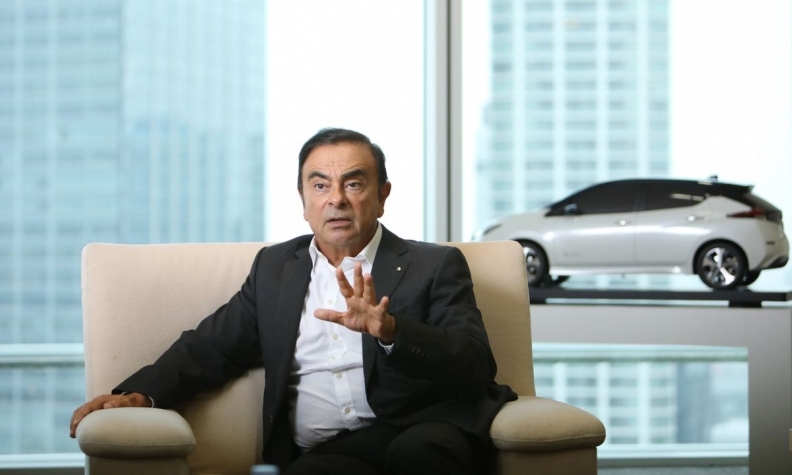 Ghosn will further reduce his roles at the three individual companies once his contribution becomes "limited," the 64-year-old executive said in an interview in Yokohama, Japan. "If there is one job for which I'm still having a strong contribution, it is chairman and CEO of the alliance," Ghosn said. "I have played a historic role in building this alliance and I have legitimacy in the three companies that allows me today to act in the way that maybe other people would not be able to." The continuing presence of Ghosn is set to soothe any uncertainty created by the companies' plan to change the pact's structure, possibly through a merger. Ghosn gave up his role as CEO of Nissan last year and has said that he may step down as CEO of Renault before his four-year term ends in 2022, fueling speculation the alliance could lose its architect and main leader for the past two decades. Shares of Renault, Nissan and Mitsubishi Motors have each declined over the past year amid intense competition and uncertainty about the alliance's future. Shares of Toyota Motor Corp. and Volkswagen AG, which are almost neck-and-neck with the alliance in car sales, have gained. "I am abandoning some jobs to delegate more, the more I consider the organizations are mature and capable to sustain by themselves with the new leadership," said Ghosn, who is also chairman of each of the three carmakers. The carmakers have given themselves two years to decide on a possible merger between them or find an alternative mechanism to enhance their partnership, Bloomberg reported in July. Ghosn said the companies will "clarify everything" within the first half of his current Renault CEO term. "The present organization of the alliance isn't something that will be stable in the future," Ghosn said in the Sept. 20 interview. "This is something that everyone wants to evolve toward something much more stable." The partnership has a complicated structure with Renault holding a large voting stake in Nissan, which has no voting rights in its smaller and less valuable partner. The two carmakers have had the pact for two decades. Ghosn added Mitsubishi to the mix in 2016, after the company was caught falsifying mileage estimates for several of its vehicles. In September 2017, Ghosn announced a six-year plan called Alliance 2022 to establish the companies as leaders in the electrification, autonomous and connected-car technologies that are upending the world's auto markets. Synergies -- or cost savings and incremental revenue -- from the companies' pact are on track to reach a goal of 10 billion euros ($12 billion) by the end of 2022, up from 5 billion euros in 2016, he said. Last week, the alliance said it struck a partnership with Google to help strengthen connectivity and services inside the car. Technology trends such as online services and artificial intelligence are forcing carmakers to transform, Ghosn said. The industry also needs to continue consolidating to pool resources and prepare for more competition and more stringent emission regulations, Ghosn said. Asked if the alliance plans to add more companies, Ghosn said it would seize opportunities though it isn't targeting anyone. "We have a great platform for consolidation of the industry," Ghosn said. "This is all based on opportunity."